On a cold dry winter’s morning, Thursday 11th February 1858, Bernadette Soubirous at just 14 years old made her way through the fields to search and collect firewood. With her friend and sister, as they ran off into the distance Bernadette sat beside the grotto at Massabielle in Lourdes France. The air was cold and still and yet all of a sudden she felt a warm gentle breeze on her arms. She looked up right in front of her was the most amazing sight. A haze of light, she tried to focus but could not, she felt the warmth around her, a comfort almost as though she was being cuddled. As she continued to look at the haze, before her would manifest a lady dressed in pure white, with a halo of white energy. She had never seen anything like this before. She was mesmerized and yet excited. This was the first apparition of the Lady, the Virgin Mary. Over a six month period, there would be a total of 18 visits. Bernadette was unable to read and write and yet this vision would quickly become an obsession. She wanted to go back to the cave, she wanted to know who this lady was and why she had come to see her. She felt an unconditional love that she had never felt before. On her second visit to the cave, just a couple of days later, Bernadette took both her sister and friend and told them of the vision. She could not contain her feelings. The word spread and within a week on the third visit Bernadette was accompanied by women from the village. It was on the third visit that Bernadette would be told by “The Lady” that "she could not promise me happy in this world, only in the next". Word spread about the visions and soon hundreds started to accompany her to the grotto. On 1st March 1858 police recorded over 1500 people, this increased to 8000 in just three days. Some were critical and suspicious, Bernadette was questioned many times by police. Never once did she change any of her stories and throughout kept her simplistic innocence. Others tried and wanted to see what she could see. There was a new pressure on Bernadette not to visit the grotto, this would break her heart, she was desperate to make another visit. Three weeks would pass before Bernadette would make her way to the grotto again this being her 9th visit. On Thursday 25th March 1858, along with a few of her friends, it was today that the Lady would reveal her name to Bernadette, she told her “I am the Immaculate Conception”. Bernadette was told to drink from the muddy spring, Bernadette started digging into the mud with her bare hands. Onlookers were dismayed, there was no water and no spring. With her face covered in mud onlookers believed Bernadette to be a fraud. Over the following days, a spring appeared and water started to flow where she had been digging. The grotto was fenced off due to the fear of religious extremism. It would be July before Bernadette would make her last visit to the grotto. People were astonished, thousands would start coming to Lourdes to see these healing waters. and to drink from the spring. People started to have miraculous healing experiences, the first miracle happened in March 1858 to Catherine Latapie. She had injured her right arm in an accident which was paralyzed. She bathed her arm which was immediately cured. The second Louis Bouriette, a quarry working who had been blinded in one eye after an explosion came to the grotto to bathe his eye. He regained his sight. Over the coming months, numerous miracles would occur. Around 1600 people accompanied Bernadette on the 13th apparition on 2nd March 1858. On this occasion, she was told, “Go and tell the priests that people should come here in procession, and a chapel should be built here”. In 1862 four years after the apparitions, permission was granted for a chapel to be built at the grotto. The land surrounding the grotto was brought. Bernadette’s father Francois Soubirous was employed to clear the land and build the first of the baths in wooden huts to the right of the grotto. Bernadette did not like the attention she was getting, she desperately sought peace and quiet. This same year the statue of Our Lady by Joseph Fabisch was revealed. She would become part of the procession at Lourdes. Bernadette did not like this statue, for her, it was not a true reflection of the lady as she had seen in her visions. Bernadette would not attend the dedication ceremony. However, in 1866, Bernadette was present for the opening of the chapel above the grotto. It is now known as the Crypt. Just two months later Bernadette would board a train to Nevers to become a nun. She would never return to Lourdes. She was known as Sister Marie-Bernard. However, during the next 13 years, she was plagued by ill health. Throughout her suffering she never went to Lourdes for healing, stating simply "it's not for me". She died at the age of 35 in Nevers in France. The very first time the hymn Ave Maria was heard at the church was the night of 27th May 1873. The pilgrims continued to visit the grotto. Hundreds of sick and disabled people attended to bathe in the healing springs. The very first volunteer to aid the sick and disabled were two men in 1880, the Hospitalite de Notre Dame de Salute was born. In 1877 the statue of the crowned virgin was installed facing the basilica. The candlelit processions made their way from the town of Lourdes down to the grotto, this would become a tradition that lasts until this very day. A place had been born where people could come, unite, pray for peace and live in hope. A place to share the love. Thirty years after her death Bernadette’s body was exhumed and found intact. After an investigation, it was declared the visions of the Virgin Mary had occurred in the grotto. In 1925 Pope Pius XI declared Bernadette blessed and in 1933 he read the declaration of Canonization of Bernadette. 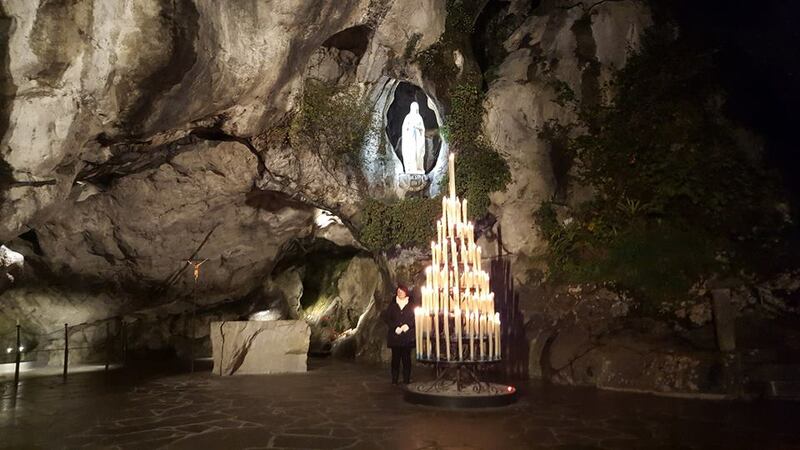 the Lady, the Virgin Mary, at the Grotto of Massabielle in Lourdes. 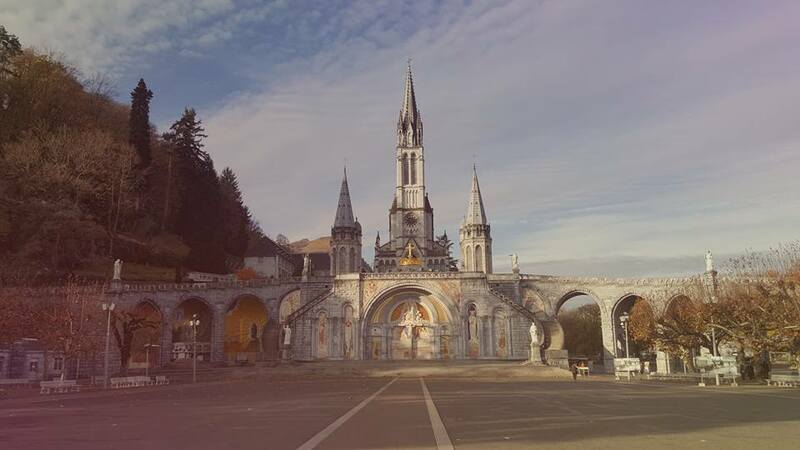 To this very day, Lourdes has over 5 million visitors every year. "Allow love to swamp you. Look for the sinners to help, forget the Saints and do what Christ did"